Frankly, are you tired of chews that do not last your large breed or powerfully jawed dog? 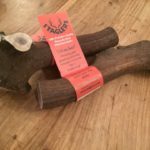 This top quality deer antler chew will prove to be an excellent investment in the long run, we promise you will talk about it for weeks, and your dog will still be chewing! Dogs instinctively gnaw and we are confident our product is going to prove to be durable. Your will be impressed with the long lasting results, giving you an opportunity to reward your dog’s devotion with something that will last. Jawsome 12 inch Antler Dog Chew – Last for months. Sold individually. Dog-Tired of your money being spent on dog chews which are chewed up and demolished, within days, by your beautiful big friend? This is the biggest chew in our range and it is the best bit of the antler for BIG dogs, so we called it the Jawsome! 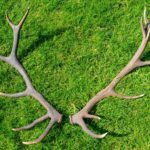 The solid 12″ length of antler includes the thick coronet which comes from the base of the antler. It is dropped off each year consequently making them the best ever eco-sustainable treat. This, like all of our chews, is totally natural, unprocessed, clean, nutritious, long-lasting and a great treat for all dogs. guaranteed, premium quality antler naturally shed from wild deer annually. This huge deer antler is a mega tough treat for very large breed dogs who have a strong bite. How do they work out to be great value for money? Simply strong, long and jam-packed with minerals and quality. This gives you a chew your pet can keep coming back to day after day. Great News! 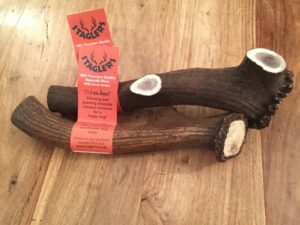 This huge deer antler is a mega tough treat for very large breed dogs who have a strong bite. They say big is best! If you have a really big dog, or a dog you want to keep busy for a long time this is the answer. We know an English Bull Terrier and Rottweiler that cannot get through it in 6+ weeks. Ideal for Newfoundland, Great Dane, Pitbull or Staffi that destroys everything else! Will suit most Brairds, Rottweilers, Ridgebacks, Mastiff etc. NB: Owing to the sheer size of this special chew we only find so many that meet our strict quality control on shape, size and true density. Therefore we keep minimal stocks. Please give responsibly. Some dogs will chew a Staglers all day if you let them. Please do not. It is very important that you monitor/supervise your dog whilst chewing and do not leave it with them for too long. After all you are giving a hard, nutritious treat! Your dog will know what to do with their treat. Leave it for him to work out how to enjoy it. Don’t hold the antler chew for him as this may cause him to bear down on it. Please don’t leave their Stagler outside, it’s not sticky so put it somewhere safe, where other creatures (i.e. slugs) cannot get to them, to safeguard your dog’s health. Avoid a choking risk, when all is “chewed and done” (worn down) you should take the Stagler away from your dog once it gets to a small enough size that your dog could easily swallow.